This Gift Pack contains all of our 10 Flavors including our Original Hot Cocoa, Mint Hot Cocoa, Orange Hot Cocoa, Raspberry Hot Cocoa, Irish Creme Hot Cocoa, Hazelnut Hot Cocoa, French Vanilla Hot Cocoa, Marshmallow Motherlode, Sugar-Free Hot Cocoa, Mexican Style Hot Cocoa. 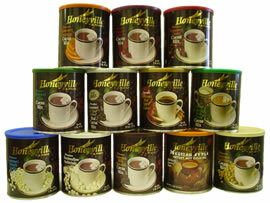 This delicious premium Hot Cocoa Mix is sure to please everyone. Now you can enjoy a creamy, smooth Hot Cocoa that tastes just right. Easily mixes with hot water for a Gourmet taste that is warm and soothing. With all of our gourmet flavors to choose from you can't go wrong. Give the gift of silky smooth chocolate taste to friends and family, or treat yourself.